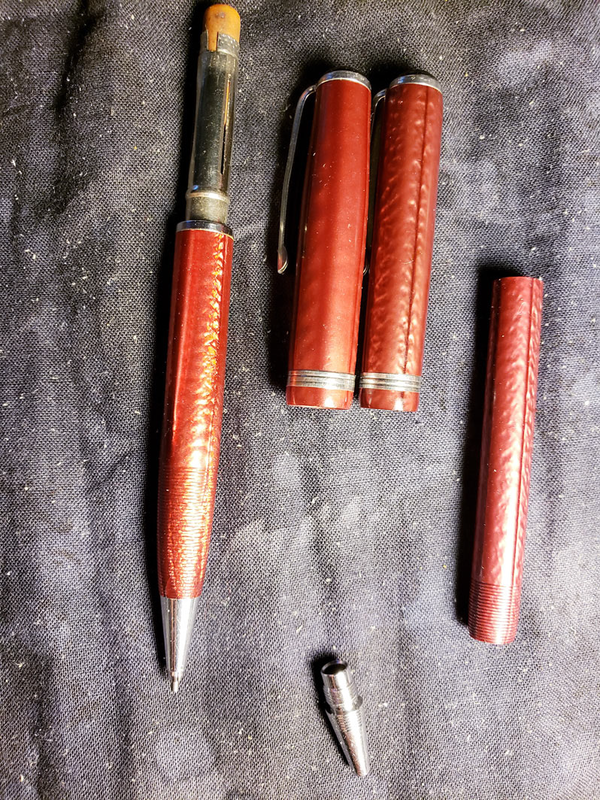 I bought a red Esterbrook Push-Pencil to try to restore. Once I got it, I discovered the previous owner thought to do the same and failed in much the same way I did. The size of the red celluloid and its cap is a different size. It is extremely thin. Much thinner than any of the 7 other push pencils I have. This person attempted to fit a .36 mechanism and it jammed, because it was too big. This shaft doesn't have threads at the back (eraser side) where you would screw in the metal ring that fastens the mechanism to the shaft. However, it does require the point to screw in, but when you do, it doesn't lay flush and it is loose. Therefore, it is likely the point didn't come with this pencil either. Does anyone know what Esterbrook push pencil is that thin? Was it part of the transitional line? The cap is also thin and does not fit on standard push pencils. I am attaching a picture. The thin one is on the left. The regular on the right. Edited by Penariffic, 25 November 2018 - 02:58. Pencils with ribbing on the nose cone were the 0.36 lead and came in thin models. TTK, I believe. I would post that page, but my account here is restricted.